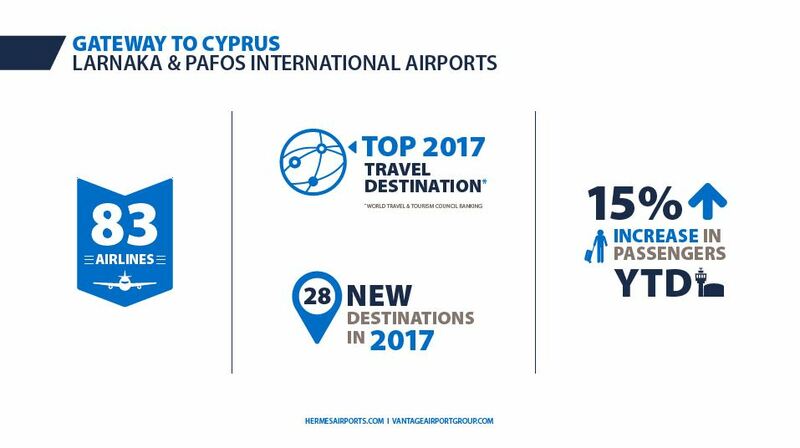 Hermes Airports’ passenger traffic has grown 15 per cent year-to-date in 2017 and 28 new destinations have been announced for the two Cypriot airports under its management, Larnaka International and Pafos International. This impressive passenger growth, which builds on last year’s 18.2 per cent increase, reaffirms that Hermes Airports’ strategy of investing in tourism development, airline incentives and stakeholder outreach is paying off. This strategy has seen Hermes Airports – part of Vantage Airport Group’s global network – take a proactive approach to promoting Cyprus as a must-visit tourist destination to holidaymakers in Europe and the surrounding region. A notable example of this approach was Hermes Airports’ close collaboration with the Cypriot government in developing a 15-year strategy for tourism on the island. In addition to fostering demand for travel to Cyprus, Hermes Airports is also attracting new carriers and routes to the island through an incentive program that supports qualifying airlines and effectively shares the risk with them. In 2017 alone, Hermes Airports has seen UK and Russian airlines continue to grow, while Cyprus-based carriers such as Blue Air and Cobalt have added new routes. The Israeli market continues to grow by double-digit numbers, and the German market is making a big comeback. As passenger traffic continues to grow, Hermes Airports has put in motion a number of initiatives – such as overhauling the security process and increasing the number of screening lanes – to better accommodate increased passenger traffic while improving the passenger experience. These steps will ensure that Hermes Airports’ growth continues to be not only robust but also sustainable, well into the future.